When I first started this blog in 2010, I only had about $300K of financial assets. I thought that was a lot of money back then, but as I learned more about personal finance I realized that it’s actually not that much. The average household net worth in Canada today is $400K. I looked at other people’s balance sheets and was really inspired by bloggers from Planting Our Pennies. They have multiple rental homes, multiple cars, and lots of stock investments 🙂 It’s because of the success of other people that has given me the motivation to work hard. Today I still do not have a $400K net worth. But I have however broken $700K in assets for the first time ever 😀 I am now in the same boat as many of my online friends and acquaintances like the P.O.Ps. I feel like I fit in more now. TD Line of Credit = $35,900 (+17,000) $9,000 of this account was used for investment purposes. Farms – In my previous Fiscal Update I listed my 1st farm with a value of $152,500, and a 10% deposit on my 2nd farm. From now on they will be combined. 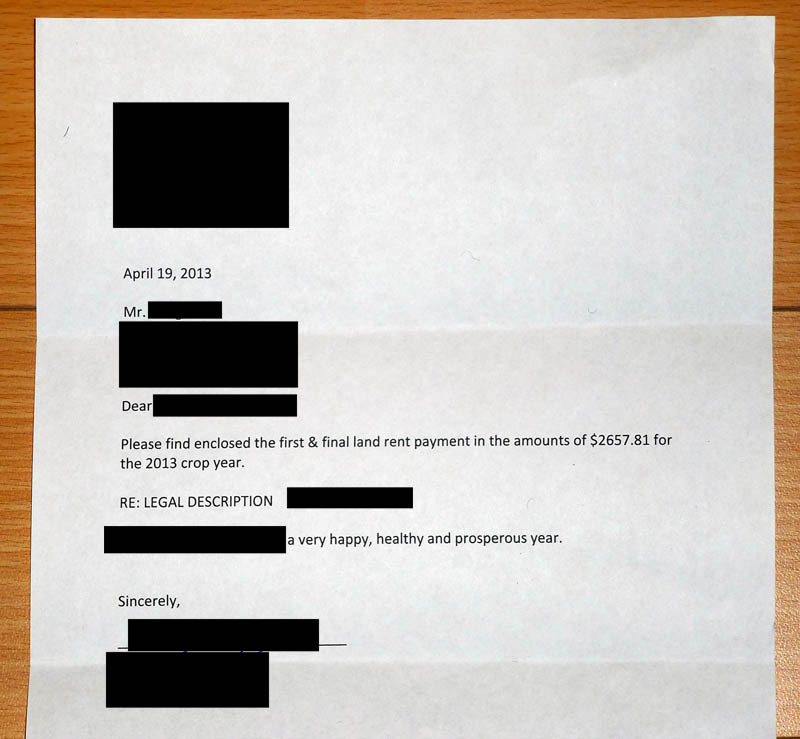 Farm loans – I got a $100,000 loan from the bank to buy my 2nd farm. I’ve combined the value with my existing loan for the 1st farm. But what knocked my toque off is that I’ve managed to exceed what I actually need and somehow doubled the size of my property fund to $50,000 😯 And it’s all thanks to liquidity. I have definitely landed among the stars 😀 A few months ago I had no cash savings, and no rainy day fund. Today, I can literally buy a brand new BMW 3 series or an Audi A5 in cash!!! Last year I wrote a post about the power of having multiple income streams. I advocated for the compound income phenomenon, which I think is very important for building wealth. If you’re not familiar with that article I recommend reading it first. So far using multiple incomes have continuously benefited my personal finances so I’m pretty confident about this theory 😉 I wonder why I haven’t seen it written about in any economic or finance book I’ve read yet. Recently read in the news that the average Canadian household now has a net worth of $400,151 CAD, a record high. Yay, time to partay＼(~o~)／ This is great news because more money translates into better purchasing power so buying goods and services become more affordable, relatively speaking. I didn’t know exactly why my net worth has been going up so quickly since the beginning of this year, but it makes more sense now with this new information. I think by being exposed to hot markets my personal finances has somehow benefited 🙂 The study points out that Vancouver still leads the country with the most wealth as the average net worth per household here is a whopping $662,600. Wowzers that’s a lot of money 😀 So far my net worth isn’t even close to that number yet but if I stay in Vancouver and continue to save and invest I’m sure one day I will become average as well haha. At my part time job for example, a lot of students I work with bring capital to the school from foreign countries. The money allows for them to get an education and is a source of income for the local Vancouverites like myself 😀 Win win. And Saskatchewan is apparently the leader of economic growth. Real estate prices increased 7.7% last year. Good thing I locked in the contract to buy the farm earlier this year for $172,500. I remember blogging about it in the spring and was nervous that I might have overpaid. But now I realize even if I did, the spread is probably gone by now anyway 🙂 I hope my land will continue to grow as other people look for investment opportunities in the prairies. But who will be the greater fool? hehe. This study is quite telling, but of course average isn’t always a good barometer of relative wealth because the numbers can be heavily skewed by the ultra wealthy. So let’s find out what the median household net worth in Canada is 😀 Last year a study that I blogged about showed the median net worth per adult is $89,014. And from the 2011 Census, we know that there are 13,320,600 private households in Canada. We also know that Canada has approximately 35,000,000 people. This means that there is roughly 2.63 people per household. If the median person is worth $89,014 then the median household would have a net worth of roughly $234,000. Probably not very scientific, but it gives us a ball park figure anyway. Last month when I increased my farm’s value, I wrote that it was “the easiest $2,500 I’ve ever made.” I just held onto an investment and the market did the rest :0) By the end of April I was so ecstatic to find my net worth has climbed by $5,200 in just one month 😀 Well just when it looked like things couldn’t get any better for me look what I received in the mail last week. I know some of you may want to buy a farm as well but have questions about renting it out. So here are some FAQs that I often get from readers about renting farmland and what to consider. Q: How do you find a tenant? A: There are lots of farmers eager to find more land to expand their grain production but a good parcel of land goes for at least $150,000 and many of them can’t afford it. So they choose to rent instead at about $5,000 or $6,000 a year for the same quality land. This gives them a more economically viable way to use the land for one crop cycle and still capitalize on the full extent of their labor. Depending on what they decide to grow, a full harvest can be sold for $30,000 to $60,000 at current commodity prices. After all expenses, including rent, farmers can still expect to make at least $20,000 of profit on the parcel, depending on the scale of their operations. Farming equipment is very costly. A combine alone costs $300,000. So for farmers who already have the necessary equipment to work, they want to maximize their opportunity to farm on as much land as possible. This is the main driver of the rental market in the farmland business. Since agricultural land is a coveted resource most farmland in Saskatchewan should already have people working on them. This is good news for owners and recent landlords like myself. The farm I bought last year already had a tenant who agreed to continue farming on the same land for another 2 years. So we signed a contract that expires end of next year (2014) Sometimes people who want to sell their land are farming on it themselves. A common situation in this case is the seller will rent back the farm from the buyer because maybe the seller needs $150,000 to buy a new tractor to expand his operations. Another reason could be that a farmer is thinking about retiring in 5 to 10 years. By selling his land he can raise some money for his retirement nest egg, and reduce his financial risk because he’d have less exposure to the fluctuations of farmland prices. It also gives him more flexibility by renting, and doesn’t tie up all his money in one asset. Q: What kind of returns can you expect from rent? A: For simple cash rent the returns are usually between 3% to 4% of the purchase price. For example, in most cases a $100,000 quarter of land can be rented for $3,000 on the low side, and $4,000 on the high side. In special situations like in very wet areas the rent could be $2,000 or lower. And if the land is fairly close to a grain factory or oil seed crushing plant or near the prospective tenant’s other operations, the rent could be as high as $5,000 per year, so it depends. The returns on farmland from cash rent used to be a more lucrative 5% several years ago. But over the last 3 years the average farmland price in Saskatchewan has increased by almost 50% while the rental rates have not yet caught up. This is good news for landlords because it gives them more power to raise rents in the future to narrow the gap between price vs rent. The return on my own farm is about 3.4% of my purchase price last year. Which is more like 3% after subtracting the $500 annual property tax. The rent and cash flow for farmland is generally not as profitable as a residential investment like a condo or a house. However farmland owners receive the benefit of less work and stress to maintain their properties. For example, I don’t need to dread getting a call at night to fix the plumbing. Don’t have to worry about costly special assessments, replacing a roof, damage to property or any insurance needs. No worries about natural disasters or burglars either. Crops can be stolen or destroyed by locusts, but it’s usually the tenant’s responsibility to buy insurance for that. Farmland delivers the most passive income of any direct real estate investment that I can think of today. Perfect for lazy investors like myself lol. Rental income on a farm may not be as high as an equally priced residential home, but I think the cost savings over the long run and less hassle make up for it. Cash rent is the most hands off and least risky way to invest in farmland and that’s what I’m currently doing. But some farm owners may prefer other methods (such as crop sharing or custom farming) which has the potential to make a 10% return or greater on the purchase price. For more info about different ways to profit from a farm check out the second and third paragraphs from my farmland investing page. A: With my limited experience I can say so far the biggest risk appears to be if you can’t find anyone to rent your land and miss out on rental income. But since average Canadian farmland prices appreciated by 19% last year in 2012, and 15% the year before that, most of the financial benefits that owners have been getting over the last several years have been through increased property value. So losing out on rent that represents a 4% return isn’t going to be a deal breaker. But it’s still important to remember that rent is real money in your pockets, while capital appreciation is just paper money, until it’s realized some day. Leaving the land unused for a year or two isn’t going to hurt the farm either. In fact, it could actually be a good thing. More on that later. However, don’t leave your farm dormant for more than a few years as it would be costly to clean it up before it’s ready to be farmed on again 😉 If you are sharing the revenue with the tenant on the grains produced rather than direct cash rent then you may risk having a poor crop year (eg: due to flooding) and not receive much income. Lastly if you bought the farm with a loan, make sure you can make the minimum loan payments even if you didn’t have rental income just in case. Q: What determines the rental rate? A: Real estate is all about the location and farmland is no exception. Rates are generally defined by a price per cultivated acre ($/ca) which is negotiated between the landlord and tenant. Many factors can affect this rate like soil quality, access to roads, amount of lakes and ponds, etc. Lower end farms which only have the capacity to grow grass will usually be rented to ranchers for $20/ca. But higher quality farms with better dirt that can produce cereal can be rented to grain farmers for $50/ca or more. That’s why grain farms are often 2 to 3 times more expensive to buy than pasture for grazing. So how do you know what to charge for rent? The best way is to find out what your neighbors are charging and ask for a similar rate. If you don’t have that information then according to this FCC video, the general rule of thumb appears to be roughly 20% of the gross revenue of farms in that area. For example, if farmers took all the crops they produced in one acre of land and sold them on the market for $200, then the rent they should pay is $40/ca to use that land. This is only a guideline however because every farm and every situation is different. Q: How is cash rent calculated? A: Total cash rent is typically calculated as a product of the rental rate and the number of cultivated acres (ca) a farm has. So if a large parcel of land has 1000 ca and goes for $40/ca then the total rent would be $40,000 a year. Farmland units are typically broken up into half mile squares called quarters, because they have the area of 1/4 of a square mile. Each quarter is 160 acres. It would take the average person about 35 minutes to walk around the perimeters of a quarter. It’s the equivalent distance of 2 miles, or 3.2 km. Q: Do you need to collect GST or HST? A: If you are renting the farm personally then you don’t have to add GST on top of the rent. But if you are running the farm as a business then it’s encouraged to charge GST or HST depending on what province you are in. It would be the same cost for the tenant either way. Assuming the rental agreement is a business transaction, the farm tenant will pay you (the landlord) GST on the cash rent. Then the tenant can claim that GST amount back when they file their GST/HST returns every year. This process is how most farmland is rented. Q: How do you collect the rent? Q: Where can you find rental agreement forms? A: The Saskatchewan government has a lot of helpful information on their website about what should be included in a farmland rental agreement. I have uploaded some of their forms and lease templates on my blog for reader’s convenience. For Cash Rent you can download this Sample Cash Lease Agreement form. It’s the same one I used with my tenant. Just need to fill in the blanks 😀 pretty straight forward. For Crop Share you can download this Crop Share Lease Agreement document which has examples of calculations, things to consider, and of course a sample agreement form which anyone may use. 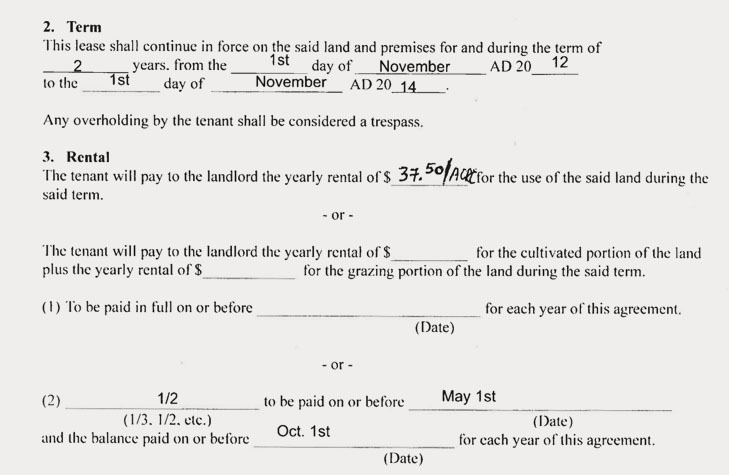 After the lease expires you can use this Lease Renewal agreement to extend the contract with your tenant if you wish. Buying residential real estate like condos is a good way to make passive income from rent as well. To save money on renting, check out the many rental rebates available. It’s a good idea to consult with real estate lawyers in your own province or state as each jurisdiction may have different rules and regulations around farmland and residential rental units.